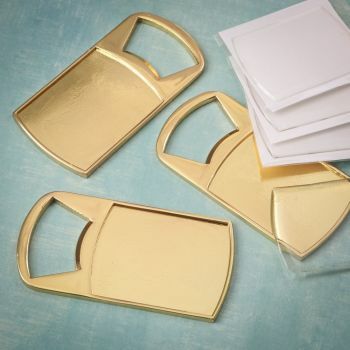 Classy gold metal bottle opener that can be customized with a label that fits into a plaque shaped inset opening. Makes a unique and thoughtful give-away for a grand occasion. The opener is made of solid caste metal with a shiny gold finish. It has a rugged design with a cut-out on the end for easy opening of beverage bottles. The top of opener has a molded metal plaque with an inset to perfectly fit a customized label. The label is covered with a clear epoxy dome that will protect and preserve it. Epoxy domes come included with the openers on easy peel and stick sheets. Bottle openers are bulk packed in a poly bag.